Poking out in the middle of downtown Santiago is a small hill big in history. Called Cerro Santa Lucia, I only saw this 'green pyramid' atop the much taller Cerro San Cristobal in 2010, never actually setting foot on it. When I later saw an old picture taken there by Che Guevara (during his South American motorcycle odyssey), I wanted to hit my head with my camera. This remnant of an ancient volcano kept nagging me. I couldn't miss it this time. Especially since I'm staying right at the very heart of town. As I got myself ready to go out early in the morning, both Katerina and Gary were already in their living room. This was my last full day in the city before the evening flight back to New York. Thankfully, my hosts allowed me to stay until 5 PM (talk about flexible check-out time - I'm loving homestays already!). Before going to her day job, Katerina gave me a hug while Gary stayed to work in his "home/office". 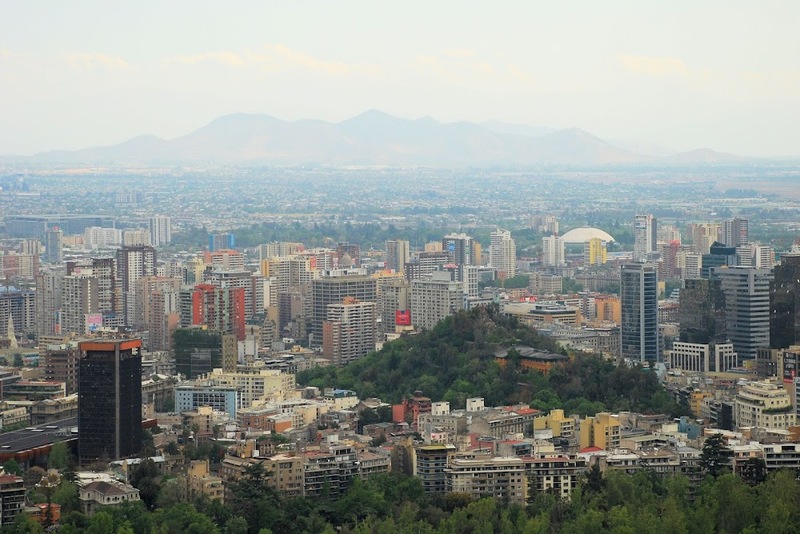 Searching for breakfast led me on a dive into Santiago's early morn bustle: office workers like Katerina hurrying into subway stations, shop owners just opening their stores, kids laden with bags going off to school. There's this familiar rush to go somewhere, pretty much like any scene I've seen in any major capital city elsewhere. We may talk different languages anywhere on the planet but our daily grind do usually start the same in the mornings. After a quick meal at a pastry shop near my host's apartment, it was merely a couple of blocks to Cerro Santa Lucia where I got some lessons in Santiago's history. Prior to Spanish conquest, this rocky hill was known to native Mapuche people as Huelén. Spanish conquistador Pedro de Valvidia came upon this hill on Santa Lucia's day in December 13, 1540 - thus the current name. Surrounding the hill was a verdant valley fed by a river coming off the Andes. For Valvidia and his men, this was just the perfect place for them. Valvidia tried to win over the indigenous people already settled in the valley. As with any conquest, they didn't trust his intentions wholeheartedly. Two months later in February 12, he officially founded the new Spanish settlement right at the foot of Cerro Santa Lucia, naming it Santiago de Nueva Extremadura. In the coming months, as the Indians fought with the Spaniards, the 69-meter hill was used as a lookout for defense and city planning. 473 years later, visitors like me go up this now hugely landscaped leafy park for the sweeping views. Admission is free and it is open year-round. At one of the entrances, I was required to sign my name - the first to do so as it promptly opened at 9 AM. Park crew were still cleaning the paths and tending the gardens as I walked up, away from the bustle of three major streets flanking this triangular-shaped hill. It's almost winter in South America and the early morning chill caught up with me. I increased my pace up the stone steps, bypassing Caupolican Plaza and some fountains, heading straight up instead to the hill's highest point. Up there on a crenellated tower, the view was spectacular, more so because I was by myself. The faint sounds of the city was beneath me while far away lay a smoggy view of the mighty Andes. My solitude was cut shortly as other visitors soon made their way up where I was. This being such a great spot, others asked me to take their Facebook profile pics (does lugging a DSLR make people think I'm a pro?) Down the other parts of the hill I went, exploring its many nook, clambering its many steep steps, gazing at its two forts, before finally looking at a bust of Valvidia. If he's alive today, he surely won't recognize the changes in the city he founded centuries ago. Cerro Santa Lucia still serves as a lookout - but with a much different purpose. Hey Edmar thanks. So true, but even just one country will yield many discoveries. At least you got to enjoy the peace and quiet up there for a few minutes. There is something really special about being anywhere in a big city all by yourself, even if it is just for a few seconds. Those precious moments of solitude up there was worth the early morn start - no one to photo bomb my pics too haha! Thanks Missy! I'm hoping to visit 2 or 3 more countries before the year ends. I'm imagining this view at night. Sarap mag overlooking siguro dito. Silhouette ba yon ng ulap or bundok? Ang ganda. The best ang mga photos mo. Salamat sa birthday greetings. Ingat lagi sa marami mong travels. Ikaw ang benchmark ko pagdating sa traveling. That's actually part of the Andes range you see - smoggy day kasi kaya nagmukhang parang ulap. It's not actually safe to go to Cerro Santa Lucia at nights due to reported muggings. those people who asked you to take their shots worthy of being their profile fb pics must see what you've been capturing from all of your travels. your photos are beyond worthy of being a postcard and can match those seen in esteemed travel mags. thank you Doc Gelo! Seeing the kind of equipment dangling on your neck, I'm sure you've been approached many times by others wanting their photos taken. another city in my radar LOL courtesy of you. kidding aside, i am as well looking more and more into homestays or vacay rentals. as we are in the process of booking for a 2-week MX trip we found that vacay rentals, like condos, are cheaper than hotels esp for long term just like that and you can even haggle with the price. Indeed, you can stay cheaper in homestays. What I like most is the chance to interact with the hosts and get insider tips from them. Hi Dennis, what a nice clear day you were blessed with when you climb the hill. It was a hazy day when I was there and didn't have as spectacular photos as you have. I missed a trip to this park when I was in Santiago and did the more popular Cerro San Cristobal. Nice to get a little solitude in such a big city.What a great set of photos. Thanks Leigh! I'd like to think we miss on some sights to give us a reason to return one day! Hi Ed! I guess others tend to be more discerning and ask someone with a DSLR hoping they'd get perfectly composed pics!